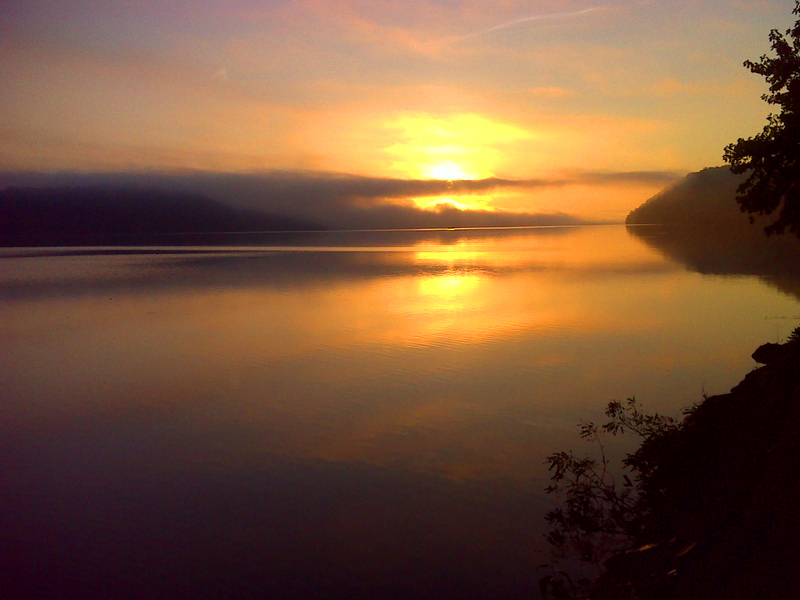 Although the Mason-Dixon Trail is 200 miles long, only thirty miles of it is designated by the US Secretary of the Interior as a National Recreation Trail. 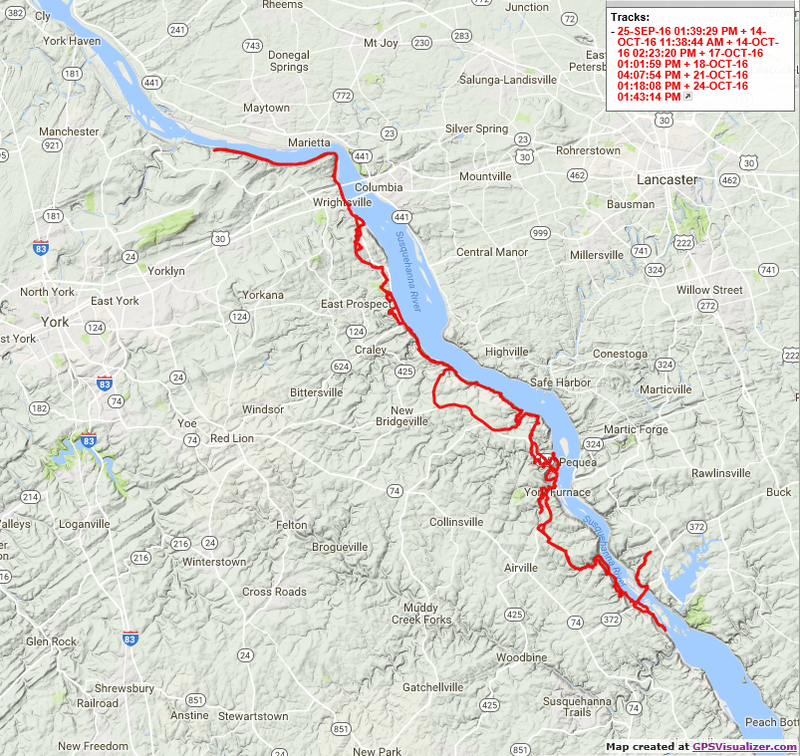 That thirty miles runs through the Susquehanna Gorge from Wrightsville, PA downstream past Safe Harbor Dam to about Holtwood Dam, and that section is the subject of this post. It's one rugged hike, brutal really. I slogged through half a dozen or more steep rocky climbs and descents. The difference between the top of the steep bluffs overlooking the river and the elevation river-side is as much as 400 feet. Numerous small streams cascade down to the river through steep sided ravines, and if the trail is going to follow the river, it has to negotiate those ravines. In some cases the trail follows roads inland and avoids the worst of the terrain. In others the trail seems to have been routed through the very worst of the rocky ridge-spines that separate the Susquehanna from each tributary ravine. I got the impression that the trail designers wanted to 'show' the hiker special rock formations such as this 'Lemon Squeezer' with a view of the river through the trees in the background. Well, you get the idea. The going was slow, the rocks were big and brutal, and the climbs were challenging. But the hiker gets his/her rewards. River views abound. Here's a sampling of some of my favorites. One of the grandest vistas on the west side, here on the Mason-Dixon Trail, can be had from the top of 'High Point', which has been preserved as a York County Park. From the summit you can see many miles of river to the south, and a fine stretch to the north as well. Most of the length of the river below Wrightsville is contained behind three dams. Conowingo backs up the river just above where it becomes tidal. Holtwood Dam is placed right where the river flows freely again, just above the upper end of Conowingo's impoundment. Safe Harbor Dam does the same for the Holtwood impoundment. In the view of Safe Harbor Dam above you can see a high railroad trestle crossing the Conestoga Creek, just below the dam. This trestle is on an abandoned rail line and remains the only closed part of a 30 mile rail trail that I will be hiking and reporting on soon. This section the Susquehanna gorge has great trails and great vistas on both sides, and arguably the quality of the hiking experience is actually better on the east side. Looking across to the east side from near Fishing Creek, one can see the two prominent windmills atop Turkey Hill. The granddaddy of all the views along this section is the view from Turkey Hill looking up river toward Wrightsville. Stay tuned. The Mason-Dixon Trail doesn't follow the river everywhere. As I mentioned there are a few road walks. The trail also meanders through the canyon of Oyster Creek and a few other larger tributaries. There's also a section of open high meadow walking through the Native Lands Heritage Park. At the north end of the section, the trail passes under the old US 30 bridge at Wrightsville. This is a pedestrian friendly bridge. Hikers could make use of it and the Norman Wood Bridge to do a multi-day circuit hike of roughly 75 miles encompassing the best trail experience on both sides of the river. Again, I'll be exploring the east side in an upcoming post. Below is a map of the track I took over six out-and-back day hikes between the Norman Wood Bridge and Wrightsville along the west side of the river. For my money this is some of the best hiking east of the Appalachians and north of Florida.